Dawn of the Planet of Apes is the second episode in a new series of prequels to 1968's classic Planet of the Apes. 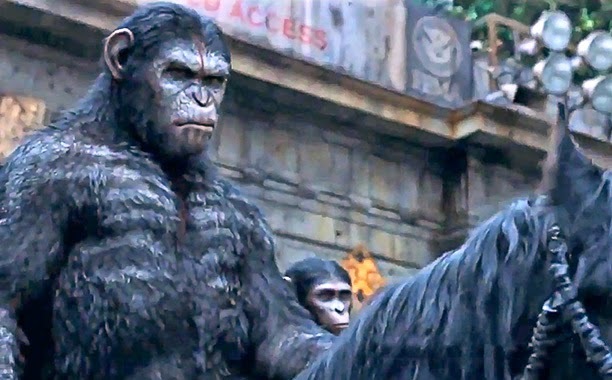 Much like after 2011's Rise of the Planet of the Apes (I saw both of these new ones with Dan), it is still not apparent how these will connect with the original, in which humans annihilate themselves with a nuclear bomb. In that respect, nothing much happens in the evolutionary course of events with this 3-D movie. It's a transitional piece. Caesar was raised a decade ago by a scientist (played by James Franco). He is now leader of the apes in Muir Woods. A plague has since wiped out 499 of every 500 humans, but a few hundred are living in a tower in downtown San Francisco. 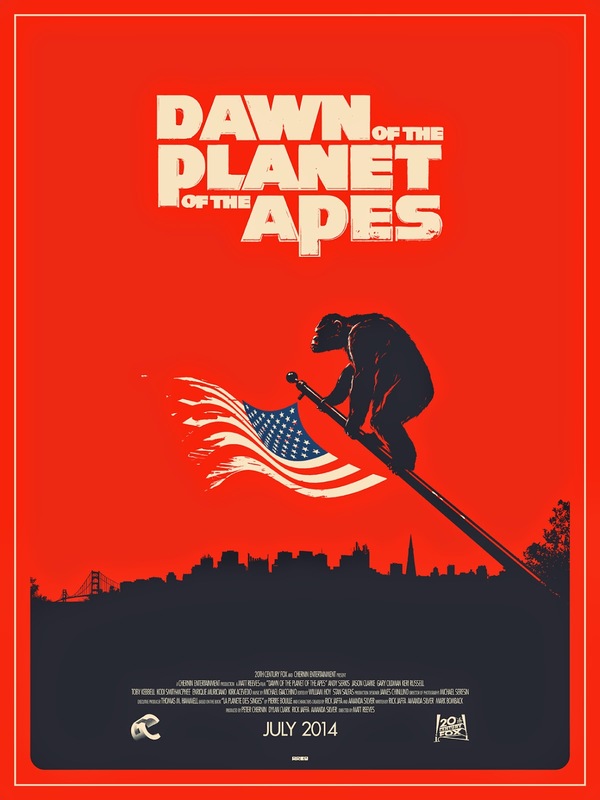 When some of them venture into the woods as a last-ditch effort to fix a dam that would provide them with enough energy to survive, the humans and the apes rekindle a relationship that has a bunch of miscommunications that could have resulted in eternal peace but instead ends ominously for what lies ahead when the next prequel is released. The apes are stunning and, if I had to cheer for a side, it wouldn't be the dumb humans. Barring Charleton Heston in the first couple of original films, humans have never really been the interesting ones in Ape movies. They are particularly unworthy of cheering for in this one. All unlikeable and clueless, even stars Jason Clarke, Gary Oldman (usually entirely reliable), and Keri Russell seem to sleepwalk in the shadow of Andy Serkis, who again plays Caesar with endless heart worthy of Oscar consideration. The stage is set. The next in this series should be a doozie, and I would say the humans are in big trouble.